He's based on the Wild Things from the book by Maurice Sendak but with my own spin on the design. Most of the body pattern comes from my own Yarny Monster pattern that was based on a picture my daughter drew so in a way she's responsible for this pattern too! All I had to do was mix the colors, do the fuzzy parts and oh yes, change the face and add the tail. time. It's just a time issue but once I get the chance I will get a pattern together for him too. Might be in 2015 though! So please be patient with me while I catch up with myself...I have other pattern promises I must get done first. As always, I'm so happy you stopped by. Please come back soon! That is the cutest set ever Sharon. Would be so cute for a gift with the book for Christmas ...I love it. thanks!! 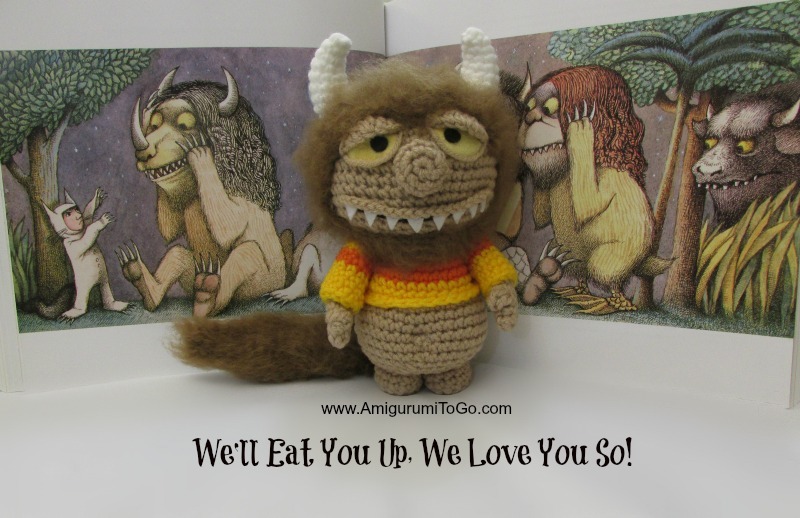 It's such a great thing to give a book.. including amigurumi with the gift is an awesome idea... I love it!! 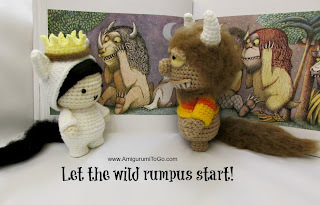 I so love this book and have searched for a pattern from this book because I love making Blankets/afghans with a stuffed animal or something special Thank you so much! Sharon, Your generosity to the crochet community is absolutely amazing! I appreciate you more than you know. My grandchildren are especially grateful to you, but I don't know who loves your designs more, the grandkiddos or me. I can see a number of monsters in my family's future! Sheer genius! You are a treasure. Love all your work. Thank you for sharing your designs, they are all truly amazing! I would absolutely love the max pattern! my mom and I read this hundreds of times through out my childhood! Its our favorite book (I'm 23 now). I am so thankful you are willing to share all of your fun projects! thank you so much!